Residents probably don't want to play a game of snowplow versus parked car. Reduce speeds and be light on vehicle controls (acceleration, turning, breaking). Check wiper blades, washer fluid and tires. Make sure you have chains that fit your tires. Keep windows clear of snow and ice at all times. TAHOE-TRUCKEE, Calif. — It may not show it on the calendar yet, but winter is here. That means there’s one big question on the minds of area drivers: Can I park here? 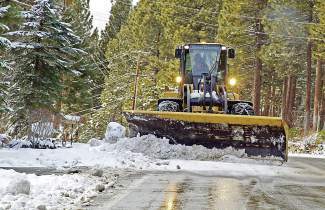 In an annual effort to make snow plowing easier and keep roadways clear for traffic and emergency vehicles, winter parking rules are already in effect throughout the Truckee-Tahoe region. In Truckee, residents and visitors are banned from parking on roadway shoulders — the right of way — in town from Nov. 1 to April 30. Those parked on the shoulders are subject to citation and may potentially be towed. Right of way includes areas on both sides of the snow poles; in other words, even if a vehicle is parked off the pavement, it may still be parked illegally, according to the Truckee Police Department. Tickets are $150 plus administrative fees, said TPD Sgt. Robert Womack. In the past, Womack said the department ticketed those illegally parked no matter the weather, but that’s not strictly the case anymore. However, drivers need to keep in mind that “during snow storms and for several days past that, you are subject to ticketing and towing” if parked in the right of way, he added. Towing is done not only for the benefit of the snowplows themselves, but also the vehicles parked in violation, Womack noted. For the North and West shores of Lake Tahoe, in Soda Springs and other local areas in Placer County, parking is prohibited on roadway shoulders from Nov. 1 to May 1. Sgt. Fred Guitron of the Placer County Sheriff’s Office in Tahoe City said the county-wide ordinance is enforced with or without snow on the ground. Fines for violators vary. For general illegal parking on the roadway shoulders, a ticket is $50. For illegal parking that obstructs plowing operations or vehicles, the citation is $98.50. The fine jumps $100 for second offenses and another $100 for third and subsequent offenses, according to the department. The Washoe County Sheriff’s Office, meanwhile, has a substantially different winter parking law than Placer County and Truckee. “We have what’s called ‘red days’ and ‘green days,’” said Lt. Jeff Clark, Washoe County substation commander in Incline Village. Red days mean snowplows are or may be operating. During this period, parking on roadway shoulders is prohibited, and violators are subject to a $203 fine. Green days mean snowplows are not expected to operate. There are no parking restrictions during this time, as long as drivers are not parked in travel lanes or obstructing the roadway, Clark said. Clark said following the ordinance on red days is especially crucial in Incline Village. To inquire about the day’s designation (red or green) in Washoe County, call 775-833-3200.